Stars And Garters: Friday Night Fights: Boom! - Round 11: Putting the "POW" in "Power Prism"! Friday Night Fights: Boom! - Round 11: Putting the "POW" in "Power Prism"! Welcome to tonight's round of Friday Night Fights: Boom!, where the special rule is that every fight must contain an onomatopoeia, and boy, does this fight have one. 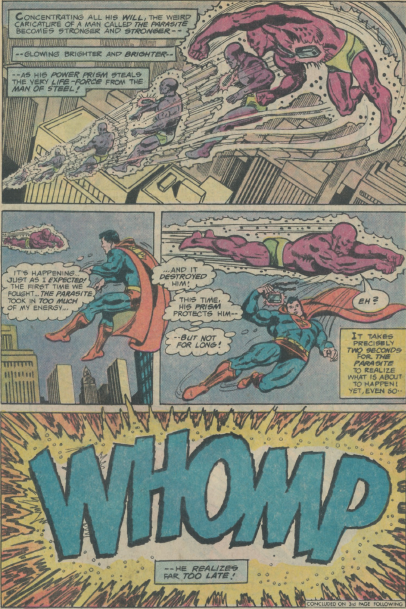 Tonight's multifaceted melee comes from Superman#304, written by Gerry Conway and illustrated by Curt Swan and Bob Oksner. Synopsis: The Parasite is once again out to drain Superman's energy, but this time he has a new Power Prism to protect him from absorbing too much of Superman's energy and blowing up. Let's see how things work out for him. Tonight's fight music comes from...Prism. For more power-draining pugilism,click here. And don't forget to vote!